The ACTH test (also called the cosyntropin, tetracosactide, or Synacthen test) is a medical test usually ordered and interpreted by endocrinologists to assess the functioning of the adrenal glands stress response by measuring the adrenal response to adrenocorticotropic hormone (ACTH; corticotropin) or another corticotropic agent such as tetracosactide (cosyntropin, tetracosactrin; Synacthen) or alsactide (Synchrodyn). ACTH is a hormone produced in the anterior pituitary gland that stimulates the adrenal glands to release cortisol, dehydroepiandrosterone (DHEA), dehydroepiandrosterone sulfate (DHEA-S), and aldosterone. During the test, a small amount of synthetic ACTH is injected, and the amount of cortisol (and sometimes aldosterone) that the adrenals produce in response is measured. This test may cause mild side effects in some individuals. This test is used to diagnose or exclude primary and secondary adrenal insufficiency, Addison's disease, and related conditions. In addition to quantifying adrenal insufficiency, the test can distinguish whether the cause is adrenal (low cortisol and aldosterone production) or pituitary (low ACTH production). The Insulin tolerance test is recognized as the gold standard assay of adrenal insufficiency, but due to the cumbersome requirement for a two-hour test and the risks of seizures or myocardial infarction, the ACTH stimulation test is commonly used as an easier, safer, though not as accurate, alternative. The test is extremely sensitive (97% at 95% specificity) to primary adrenal insufficiency, but less so to secondary adrenal insufficiency (57-61% at 95% specificity); while secondary adrenal insufficiency may thus be dismissed by some interpreters on the basis of the test, additional testing may be called for if probability of secondary adrenal insufficiency is particularly high. Adrenal insufficiency is a potentially life-threatening condition. Treatment should be initiated as soon as the diagnosis is confirmed, or sooner if the patient presents in apparent adrenal crisis. This test can be given as a low-dose short test, a conventional-dose short test, or as a prolonged-stimulation test. In the low-dose short test, 1 µg of an ACTH drug is injected into the patient. In the conventional-dose short test, 250 µg of drug are injected. Both of these short tests last for about an hour and provide the same information. Studies have shown the cortisol response of the adrenals is the same for the low-dose and conventional-dose tests. The prolonged-stimulation test, which is also called a long conventional-dose test, can last up to 48 hours. This form of the test can differentiate between primary, secondary, and tertiary adrenal insufficiency. This form of the test is rarely performed because earlier testing of cortisol and ACTH levels in association with the short test may provide all the necessary information. The test should not be given if on glucocorticoids or adrenal extract supplement, as these will affect test results. Stress and recently administered radioisotope scans can artificially increase levels and may invalidate test results. Spironolactone, contraceptives, licorice, estrogen, androgen (including DHEA) and progesterone therapy may also affect both aldosterone and cortisol stimulation test results. To stimulate aldosterone, consumption of salt should be reduced to a minimum and foods high in sodium avoided for 24 hours prior to testing. Women should ideally undergo testing during the first week of their menstrual cycle as aldosterone (and occasionally cortisol) may be falsely elevated in the luteal cycle secondary to progesterone inhibition, leading to a compensatory rise in aldosterone levels. Traditionally, cortisol and ACTH levels (separate lavender top tube) are drawn at baseline (time = 0). Next, synthetic ACTH or another corticotropic agent is injected IM or IV, depending on the agent. Approximately 20 mL of heparinized venous blood is collected at 30 and 60 minutes after the synthetic ACTH injection to measure cortisol levels. ACTH samples are kept on ice and sent immediately to the laboratory, whereas cortisol does not need to be kept on ice. Commonly reported reactions are nausea, anxious sweating, dizziness, itchy skin, redness and or swelling of injection site, palpitations (a fast or fluttering heart beat) and facial flushing (may also include arms and torso), but should disappear within a few hours. Rarely seen, but serious side effects include rash, fainting, headache, blurred vision, severe swelling, severe dizziness, trouble breathing, irregular heartbeat. 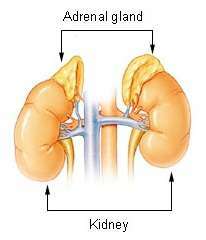 The adrenal glands sit atop the kidneys. In healthy individuals, the cortisol level should double from a baseline of 20-30 µg/dl within 60 minutes. For example, if the serum cortisol level was 25 µg/dl before the stimulation, it should reach at least 50 µg/dl. In Addison's disease, baseline cortisol is well below 10 µg/dl and rises no more than 25 percent. Location of the pituitary gland. An ACTH plasma test should always be given at the same time as the ACTH stimulation, although many doctors consider the test inaccurate. This test measures how much ACTH the pituitary gland is producing. A healthy ACTH value should be just into the upper third of the range (assuming a range of 10–60 ng/L). The ACTH plasma and ACTH stimulation test together can give a clearer picture, especially for secondary adrenal insufficiency. ACTH will be high - either at the top or above range. In Addison's disease, ACTH may be way above range and may reach the hundreds. In very rare cases can reach the 1000s and 2000s. ACTH will be low - usually below 35, but most people with secondary fall within the range limit. Although uncommon, values for ACTH can reach into the low 40s. In some cases, actual cause of low ACTH is from low CRH in the hypothalamus. It is possible to have separate ACTH and CRH impairment such as can happen in a head injury. The ACTH stimulation test is occasionally used to test adrenal production of aldosterone at the same time as cortisol to also help in determining if primary (hyperreninemic) or secondary (hyporeninemic) hypoaldosteronism is present. Human ACTH has a slight stimulatory effect on aldosterone, but the amount of synthetic ACTH given in the stimulation is equivalent to more than a whole days production of natural ACTH, so the aldosterone response can be easily measured in blood serum. Same as cortisol, aldosterone should double from a respectable base value (around 20 ng/dl, must fast salt 24 hours and sit upright for blood draw) in a healthy individual. The aldosterone response in the ACTH stimulation test is blunted or absent in patients with primary adrenal insufficiency including Addison's disease. The base value is usually in the mid teens or less and rise to less than double the base value thus indicating primary hypoaldosteronism (sodium low, potassium and renin enzyme will be high) and is an indicator of primary adrenal insufficiency or Addison's disease. Aldosterone response of several factors from a low base value. This factoring indicates secondary hypoaldosteronism (sodium low, potassium and renin enzyme will be low). Usually doubling to quadrupling from a low base aldosterone value is what is seen in secondary adrenal insufficiency. Decoupling of aldosterone in the ACTH stimulation test is possible (i.e. 2 ng/dl stimming to 20). A result of doubling or more of aldosterone may help in tandem with a cortisol stimulation that doubled or more confirm a diagnosis of secondary adrenal insufficiency. In rare cases, an aldosterone stimulation which did not double, but with the presence of low potassium, low renin and low ACTH indicates atrophy of aldosterone production from the prolonged lack of renin. Similar to the cortisol stimulation in ACTH deficiency, the test interpreter may lack knowledge of how to properly interpret for secondary hypoaldosteronism and think a result of aldosterone doubling or more from a low base value is good. 1 2 3 Dorin RI, Qualls CR, Crapo LM (2003). "Diagnosis of adrenal insufficiency" (PDF). Ann. Intern. Med. 139 (3): 194–204. doi:10.7326/0003-4819-139-3-200308050-00017. PMID 12899587. 1 2 Elizabeth H. Holt (2008). "ACTH (cosyntropin) stimulation test". ↑ Hanukoglu A, Fried D, Nakash I, Hanukoglu I (Nov 1995). "Selective increases in adrenal steroidogenic capacity during acute respiratory disease in infants.". Eur J Endocrinol. 133 (5): 552–6. doi:10.1530/eje.0.1330552. PMID 7581984. 1 2 3 unknown. "GENERIC NAME: COSYNTROPIN - INJECTABLE (koe-sin-TROW-pin)". ↑ Hormones (Athens). 2012 Oct-Dec;11(4):428-35. Is the 250 μg ACTH test a useful tool for the diagnosis of central hypoadrenalism in adult patients with pituitary disorders? Ferrante E1, Morelli V, Giavoli C, Mantovani G, Verrua E, Sala E, Malcmiodi E, Bergamaschi S, Profka E, Cairoli E, Palmieri S, Chiodini I, Lania AG, Spada A, Peccoz PB. 1 2 Evangelia Charmandari; George P.; Chrousos, M.D. "ADRENAL INSUFFICIENCY Chapter 13". ↑ Abdu TA, Elhadd TA, Neary R, Clayton RN (1999). "Comparison of the low dose short synacthen test (1 microg), the conventional dose short synacthen test (250 microg), and the insulin tolerance test for assessment of the hypothalamic-pituitary-adrenal axis in patients with pituitary disease". Journal of Clinical Endocrinology and Metabolism. 84 (3): 838–43. doi:10.1210/jc.84.3.838. PMID 10084558. ↑ Cemeroglu AP, Kleis L, Postellon DC, Wood MA (July 2010). "COMPARISON OF LOW AND HIGH DOSE COSYNTROPIN STIMULATION TESTING IN CHILDREN". Pediatrics International : Official Journal of the Japan Pediatric Society. 53 (2): 175–80. doi:10.1111/j.1442-200X.2010.03203.x. PMID 20626639. ↑ Emily D. Szmuilowicz; Gail K. Adler; Jonathan S. Williams; Dina E.Green; Tham M. Yao; Paul N. Hopkins; Ellen W. Seely (2006). "Relationship between Aldosterone and Progesterone in the Human Menstrual Cycle". Journal of Clinical Endocrinology & Metabolism. 91 (10): 3981–3987. doi:10.1210/jc.2006-1154. PMID 16868049. 1 2 3 4 unknown. "ACTH Rapid Stimulation Test (Cortrosyn, Cosyntropin)". ↑ NIDDK's Office of Health Research Reports. "Addison's disease". 1 2 K. Pagana, RN; T. Pagana. "Mosby's Diagnostic and Laboratory Test Reference 2nd ed. : Adrenocorticotropic hormone stimulation test": 17–18. 1 2 Ashley B. Grossman (2007). "Addison's Disease". Endocrine and Metabolic Disorders: 4. ↑ Lynnette K Nieman (2008). "Corticotropin-releasing hormone stimulation test". ↑ unknown. "Role of ACTH in Regulation and Action of Adrenocorticoids": 7 of 52. ↑ unknown. "Aldosterone and Renin". ↑ L.A. Cunningham; M.A. Holzwarth (1988). "Vasoactive intestinal peptide stimulates adrenal aldosterone and corticosterone secretion". Endocrinology. 122 (5): 2090–2097. doi:10.1210/endo-122-5-2090. PMID 3359977. 1 2 Jardena J. Puder; Pamela U. Freda; Robin S. Goland; Michel Ferin; Sharon L. Wardlaw (2000). "Stimulatory Effects of Stress on Gonadotropin Secretion in Estrogen-Treated Women*" (PDF). The Journal of Clinical Endocrinology & Metabolism. 85 (6): 2184–2188. doi:10.1210/jc.85.6.2184. ↑ unknown. "ACTH Stimulation Test for 21-Hydroxylase". ACTH stimulation test - Procedures/Diagnostic tests Warren Grant Magnuson Clinical Center National Institutes of Health.